When I saw this bible I knew my preteen ( she is 12) would love it. I love to study the women of the Bible, so having the "Women of the Bible" section is something I personally found to be very enlightening. Not to mention the beautifully designed pages filled with a pleasing pink background and funky edging, what's not to love about this edition? This bible will make a wonderful edition for any 13- 18 year old on your list. This is not a "Study Bible" but a wonderful every day bible, sturdy with its hard cover and durable pages. 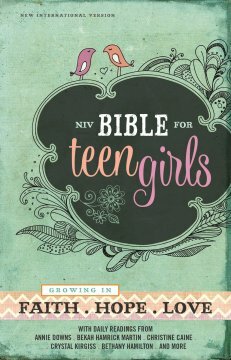 All in all I would highly recommend this Bible for your teen girls. I was given this bible in exchange for my honest review.